Pay dirt!’ I am sure this term or an equivalent would have escaped the mouths of certain people when the much ‘celebrated’ (yes!) mass graves in Mannar were discovered. Of course ‘pay dirt’ technically refers to a site where the ground contains ore in sufficient quantity to be profitably extracted. As a metaphor, ‘striking pay dirt’ or having ‘hit pay dirt’ is about achieving success beyond expectation, usually in financial terms. Should we be surprised? No and not because Bachelet is some kind of noxious creature. She has decent enough credentials. The problem is that people like her take certain things at face value. What’s come before, they believe (we have to conclude) to be ‘the truth’. Well, THE TRUTH. That kind of fixation has a way of tripping people. Well, now it seems that the said mass grave is dated back to 1499 to 1719 CE, according to tests done by the Beta Analytic Institute, Florida, USA. Bechelet may have not known (which indicates sloth) or knew very well (which indicates she’s toxic) when she tabled that report. Those who were ecstatic when these graves were discovered and may have uttered equivalents of ‘Pay dirt, baby!’ are playing ostrich right now. There’s been no apologies or explanations. How did this happen? Perhaps it is about a kind of arrogance and insane determination laced with punditry and rage. Why are they in such a hurry that they would with finger-snap treat opinion as fact, never mind the basic of any decent investigation such as reliability of source, corroboration, sensitivity to contexts etc.? We saw all this during the so-called ‘peace process’ initiated by Ranil Wickremesinghe and Velupillai Prabhakaran on February 22, 2002. The peace-makers, so-called, engaged in subterfuge and it was all about language. They refused to understand that ‘peace’ in any given context can mean different things to different people. So anyone and everyone who did not subscribe to their version of peace was branded ‘warmonger’. That discrediting, ideologically and politically, at least in the short-term, worked. You take on the good-guy label. You get to ride the moral high horse. So they defined ‘peace’ as an accommodation of the LTTE, as a federal ‘solution’ or, at least, some kind of devolution that went beyond the 13th Amendment. Having thus decided, it was easy to pick sides, to make political choices based on who was more amenable to delivering this ‘peace’. Simultaneously, it became imperative that those believed to be detrimental to such designs be attacked mercilessly. To be fair, that’s what ‘the other side’ did as well, except perhaps they had the logical edge of having fact and reality on their side. It’s the same scenario that we are witnessing today in the altered narrative, i.e. ‘reconciliation’. The term is taken as an eventuality where the nature of the state is altered from unitary to federal, although it won’t be called that (as M.A. Sumanthiran of the TNA, like the ideological predecessors in the Tamil communalist camp, did: federal in substance if not in name AND substance). It’s a simple plan. You give a sweet-sounding term (e.g. peace, reconciliation) to your pernicious design and gather ‘facts’ to support the case, picking bones and, as the Mannar mass grave fiasco showed, even picking ON bones. The lovelies forget (or have they, really?) in their rush to get to wherever any which way possible, that these things are about PROCESS. Yes, ‘process,’ which is defined as ‘a series of actions or steps taken in order to achieve a particular end’. In the case of disputes about the ‘particular end’, one has to consciously unfetter oneself from preferred outcome. Political actors don’t do this of course, but those who would be facilitators (e.g. the Bechelets, the Navi Pillais and the peace/reconciliation advocating I/NGO) ought to. They didn’t during the ‘peace (sic) process’ and they do not, now, in the ‘reconciliation (sic) process’. That’s just one aspect only. There’s also the matter of bones. We are talking of a 30 year war where two armed groups shot to kill. We are talking about bombs and the firing of multi-barrel guns, claymore mines and territories laden with anti-personnel mines. Of course the number of dead is disputed and depending on political expediency either inflated or deflated. What’s indisputable is that people died and in many cases in circumstances that did not permit formal funerals. What did combatants who survived a particular attack do with the dead (their own and those of the enemy)? In certain situations the demands of warfare probably did not permit them to worry about what to do with the dead, but when there was space for such things, would they not have buried them? Would any fighting force pushed by the life-or-death of combat worry about some rogue agent talking about mass burials and immediately concluding that those buried were summarily executed? People died. People were killed. It was a war. Mass graves do not necessarily imply mass slaughter. However, if you have for whatever reason convinced yourself (against all verifiable evidence by the way) that war crimes did take place, that there was a policy decision to slaughter a community etc., then one would most certainly conclude that any burial site containing dozens of bodies was ‘evidence’ of ‘genocide’ (to use another happy-pill word of the politically ignorant, ideologically narrow-minded and those hampered by a limited vocabulary). And now we have a situation where there are various theories about who really killed and buried those people. There’s one which claims it was a Tamil ‘king’ who slaughtered Tamils who had converted to Christianity. And so, while we are at it, can some really enlightened truth-seeker demand that every inch of the island is excavated so that several strata that indicate different periods of history are ‘covered’ or rather unearthed, just so we can figure out who killed whom and when? We might get some embarrassing data about the atrocities of the Dutch, Portuguese and British, right? And, we might also get a different kind of embarrassment. 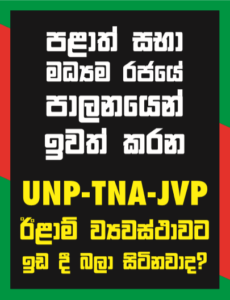 For example, some wide-eyed UN Secretary General or High Commissioner for Human Rights might say that Balangoda Man is Velupillai Prabhakaran or that the LTTE’s military high command was killed and buried at Ibbankatuwa! That’s the problem with digging for bones — you really don’t know what you might come up with! However, you cannot have half-way measures with such things. If you want the truth, the whole truth and nothing but the truth you can’t really stop digging. You can’t stop with one ‘mass burial site’ simply because ‘justice’ should be served to all, to borrow from their lexicon. Does this mean that such discoveries should be brushed aside as irrelevant in the reconciliation process? No, they aren’t. However, making a song and dance about it before any serious tests have been done is silly and indeed detrimental to the very same process simply because it distracts and discredits. We are not close to reconciliation, however you want to define it. The Mannar ‘mass burial site’ has, in a grotesque way, demonstrated one of the reasons why we aren’t getting closer. Pay dirt. That’s the word. And we can play with that. Ill-gotten ‘gains’ for example, for the Sinhala word for dirt is ‘jaraava,’ a word that is colloquially used to refer to the ill-gotten. Or ill-excavated. Or, as in this case, the ill-interpreted.